OSHA’s citation of SeaWorld suggests that some sort of air supply system could be used to allow waterwork to resume between SeaWorld’s trainers and the park’s killer whales. But a group of former trainers has approached OSHA to make clear that so-called “spare-air” will not keep trainers safe. Their argument boils down to three points: 1) many of the incidents (partial list here) between trainers and killer whales involve physical trauma, where lack of air is not an issue (and that Dawn Brancheau was killed by traumatic injury; air would not have changed the outcome); 2) giving trainers new equipment, which involves hoses, squeaks and other noises, might just give killer whales something else to grab, and might also unsettle them, leading to more incidents, not fewer; and 3) that even if a trainer involved in an incident did manage to get a regulator in his or her mouth despite the violent motion and high speeds often involved, taking a lungful of air creates a danger of lung overexpansion (which can be deadly) if a whale with a trainer rapidly ascends from the bottom of the pool to the surface. The trainers sent statements on spare air to OSHA, and have shared them with OrcaAware. You can read them here. The Orlando Sentinel has taken note of the argument the former trainers are making, in this article. And former trainer Samantha Berg appeared on Fox News’ Fox & Friends to discuss the issue, and trainer safety at SeaWorld. Ken Balcomb, of the Center For Whale Research, explains to Carl Safina, of the Blue Ocean Institute, how the decline of the northwest salmon population is affecting the future of Puget Sound’s killer whales. Very moving. It’s not uncommon for SeaWorld to take down comments, or ban commenters, from its Facebook fan page if it doesn’t like what’s being said. But it is nevertheless an interesting experience. In case you have never been banned yourself, this is what you get back when you write a very reasoned objection to being banned. SeaWorld’s responses are in bold, and they came from none other than Fred Jacobs, VP Of Communications. Dear SeaWorld, I am writing for a couple of reasons and I will be honest in my position within this message. I am a Zoology student who, admittedly, is against the keeping of cetaceans in captivity. From my point of view, I think SeaWorld is a good park, apart from this aspect. We appreciate your candor, but displaying cetaceans really is at the core of what SeaWorld is all about. You offer your position in clear terms, however, and we respect your opinion and your right to offer it. This is my personal opinion but I wanted to be honest within my message. Pending the recent tragedy at the Orlando park, I was directed to email Fred Jacobs r.e. my questions on animal care and although I received an immediate response indicating that he will get back to me straight away, I am still to hear from him – this was over three weeks ago now. I apologize for the delay. This, as you might expect, is a difficult time for us. I’ve had a lot of pressing matters to attend to. I am quite upset at having just today been blocked from the SeaWorld Orlando fan page on FaceBook. This is a SeaWorld fan site. You can say what you please where you please, but we are under no obligation to provide you with a forum that you then use to criticize us. I have never used offensive or abusive language in any of my posts – rather I will put across my opinion on already existing threads in a passive way, with supporting evidence backing up my points. Only once have I started a thread on the wall and that was merely explaining a publication by Graeme Ellis which the SW admin team misquoted statistics from (I explained what the actual statistics were in reference to and I knew this because I had been in communication with Graeme Ellis myself). Again, I’m not sure why you feel it is your right to criticize us on our own Facebook site. There are thousands of Web sites, and probably dozens of Facebook sites, devoted to the debate over marine mammals in captivity where your comments would be appropriate. As someone who has a huge passion for orca, having worked with the likes of the WDCS, BDMLR and Dr. Ingrid Visser, I am deeply upset to have been treated in the way that I have by the SW admin team. WDCS, like Ingrid Visser, has stated its opposition to SeaWorld many times. Both want places like SeaWorld to close forever. That is their right, but we disagree completely with what they stand for. I’m not sure why you feel that an association with WDCS or Dr. Visser gives you the right to criticize SeaWorld on its own Facebook site. I have myself been to SW two or three times and even participated in two of the behind-the-scenes programmes. I am from England, not the USA, but I am under the impression that like in England, America believes in freedom of speech so long as it is respectful and polite. You have a clear right to say what you please. You do not have a right to say anything you please on our Facebook site, however. I have been nothing but respectful and polite and so am deeply upset to find that I have been removed from commenting on this page. I hope I can have at least some explanation as to what offence I have caused for this to have happened, if not a reversal of the situation. Many thanks for your time and I really do look forward to hearing from you. Yours sincerely, XXXXX. But wait, our intrepid commenter was not satisfied with SeaWorld blowing her off on what she believed to be a distortion of Graeme Ellis’s work. So what did she do? She wrote Graeme Ellis, of course. The reason why I am emailing you is because there is a bit of a debate going on on the SeaWorld fanpage (as well as a few other pages) on Facebook at the moment. There are a number of people who are trying to raise awareness about certain areas of research conducted which suggests that captivity isn’t great for certain animals (especially dolphins). I believe that it is important for people to make an informed decision about marine parks and captivity of certain animals and that education is so very important, so long as the information is presented in an honest and polite manner. I am finding it difficult to understand the article, but I am aware of statistics published in your 1990 report for the IWC suggesting that female orca have an average life-expectancy of 50.2 years (80-90 maximum longevity) and males have an average life-expectancy of 29.2 years (50-60 maximum longevity) and I am under the impression (from the WDCS report I mentioned earlier) that these findings were also published in your 1994 “Killer Whales” publication. There is much argument going back and forth about this, as well as about your opinion on captivity. So I thought, who better to ask than Graeme Ellis himself! So go the PR wars over the morality and humanity of captivity of marine mammals. We think SeaWorld, and Fred Jacobs, are going to be in trouble when this fact-loving, and admirably persistent, student graduates and has more time. One of the problems for orcas in captivity is that they tend to die young. So it was sad, but not surprising, to hear of the death of 12-year old Sumar at SeaWorld San Diego earlier this week. SAN DIEGO — A killer whale died Tuesday afternoon at SeaWorld, prompting the cancellation of whale shows at the park, officials told 10News.According to SeaWorld officials, trainers noticed that the whale named Sumar was not feeling well on Monday. Veterinarians were notified and blood samples were taken.Despite being given antibiotics, Sumar’s condition worsened Tuesday and he was declared dead shortly before 1:45 p.m., park officials said. “Unfortunately … he did not respond,” said SeaWorld spokesman Dave Koontz. “His condition continued to deteriorate today. … Whatever illness he had, it moved very fast.”Park officials told 10News the 12-year-old whale had no prior history of major health problems.The whale was removed from the park grounds and a necropsy will be performed to determine the cause of death, 10News reported. Koontz said it was a “very sad day” for trainers and other staff members at SeaWorld.”They love these animals,” Koontz said. “They are devoted to these animals, and (the death of one is) like losing a member of their family.”Killer whales in captivity routinely live into their 30s or 40s, according to Koontz. It would be nice if SeaWorld would release the results of the necropsy, because the reasons killer whales in captivity die suddenly are not very well understood. And despite what Koontz says, they DO NOT routinely live into their 30s and 40s. Of the 41 orcas still alive in captivity, only two have survived long enough to reach the age of 40, and only three have survived long enough to reach the age of 30. More than 130 have died before reaching those ages (details here). Sumar has taken his last bow. To give you a sense of how young orcas in captivity mostly are when they die, here is a list of orcas that have died at SeaWorld over the years, and their age at death (which doesn’t include more than a dozen stillbirths or miscarriages). There are lots of pics of Sumar here. And here is some video of Sumar doing what Sumar was trained to do. As a person who has been monitoring the SeaWorld Orlando fan page of FaceBook over the past 6 months, what you are being told is happening with him, and what is actually happening are two very different stories. When you ask SeaWorld, “What are you doing with Tilikum?”, they give you the same answer. “He is still interacting and socializing continually with the other whales, he gets just as much interaction, play, stimulation from the trainers and is doing very well.” – then they post this blog for reference. Here it says that “Tilikum is no exception”, however, he is an exception. He is now linked to 3 deaths and clearly has issues with a couple of the other females who do not blend well socially so, therefore, they are separated. Taima, who in June of 2010 died due to complications while trying to give birth for the 4th time in her short 20 years of life – was Tilikum’s “best friend”. The two were often together and now that she is gone, he really has no one like her. Trua (a male orca) and Tilikum are friendly, however, in the 2 days I watched them – they were not put together one time. 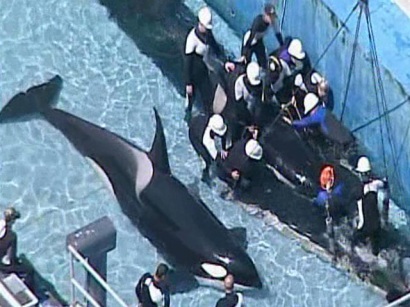 In fact, Tilikum was alone from 9 am on the morning when we arrived, until 7 pm the on the second day. After viewing Tili for nearly 10 hours – two days in a row – I witnessed him in total isolation from the others over the course of those 20 hours. The others were allowed to mingle with each other, however, Tilikum was not given that opportunity on those two days.